Sites will receive a Certificate of Compliance after the site visit if they score 5 or more points in each of the five sections of the Monitor’s Site Report. If a site has been monitored more than once, the Certificate will be awarded based on the results of the final visit. 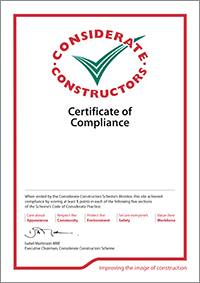 This Certificate indicates a level of consideration, beyond statutory requirements, to the neighbour, the workforce and the environment. 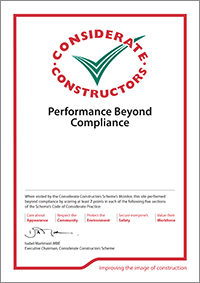 Sites will receive a Certificate of Performance Beyond Compliance after the site visit if they score 7 or more points in each of the five sections of the Monitor’s Site Report. If a site has been monitored more than once, the Certificate will be awarded based on the results of the final visit. This Certificate indicates a higher level of consideration, beyond statutory requirements, to the neighbour, the workforce, and the environment. Sites will receive a Certificate of Excellence after the site visit if they score 8 or more points in each of the five sections of the Monitor’s Site Report. If a site has been monitored more than once, the Certificate will be awarded based on the results of the final visit. This Certificate indicates a high level of excellence, beyond statutory requirements, to the neighbour, the workforce, and the environment.